Hi, I agree. It can not provide any isolation from the mains and IMO is dangerous to use. It is not suitable for the project. Yes you are right. I have ordered fully isolated transformer now. But strange it did work (not good but it did) at upstart and i acually blowed output at a REGA DAC before I found out it was not suitable. So now I starded to fix final stage at the Rega..
My old Russian 6n1ps have arrived and they are very much noise free! 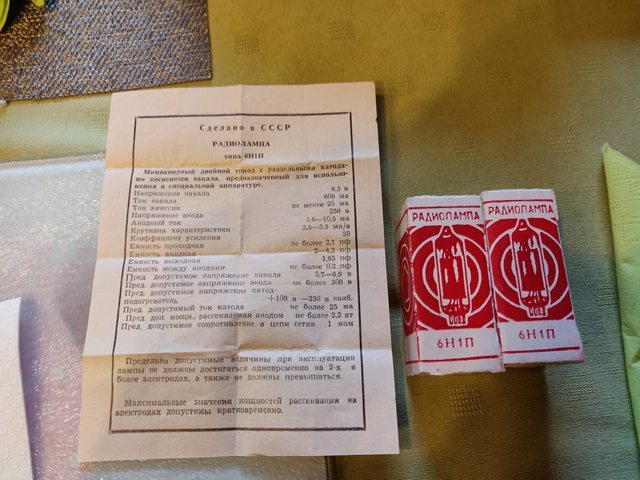 On top of that, I now have some neat USSR era boxes and a specsheet to hang on to. I might experiment with some more of these old russian tubes, seeing as you can get 4-5 matched pairs for the price of one set of Western NOS ones. I'll just have to keep an eye on the power trans, and maybe add some more ventilation to the case in case things get a bit toasty.